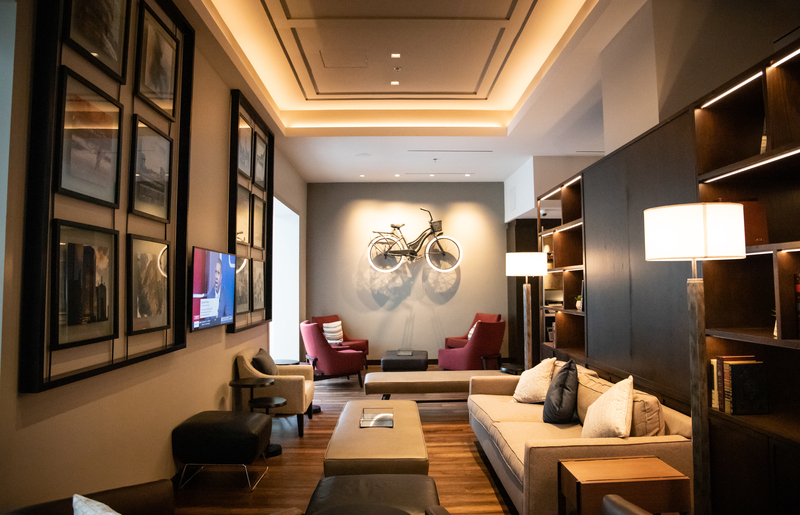 With the recent renovations of the Sheraton Hotel Downtown, the hotel looks sparkling brand new from the inside out. From new imaginative and colorful art installations by local artists to a brand new chef, there is plenty to be eager about – including an upcoming beer garden and patio. Add in five innovative dining concepts, and the hotel is bringing out all the stops for an exciting and delicious dining experience. Here's everything you need to know about the new concepts. Start your day at Moka Pot. The coffee shop brews Italian coffees and offers sweet treats in an airy and modern space. Try the vegan sticky bun with a cappuccino or have biscottis for an afternoon pick-me-up. Tip: If you enjoy Moka Pot's aesthetic, you're in luck – their collection of fun coffee mugs and pots are also available for purchase. 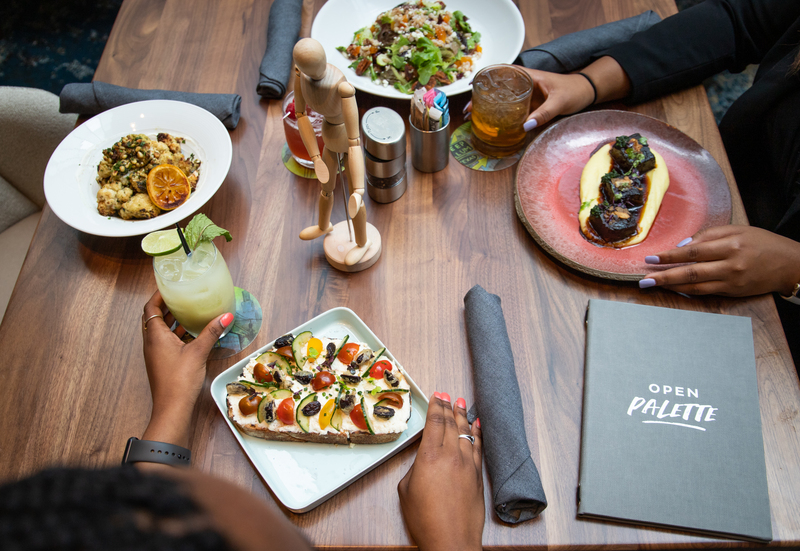 Serving everything from meatball subs to wagyu beef short ribs, Open Palette puts its own creative twists on classic dishes and extends that creativity into their space with an artist palette theme. Their colorful cocktails, made with freshly made mixes, are also a stand out. Try the Yellow cocktail, a pineapple infused vodka drink, or sip the Brown cocktail, a rich bourbon, coconut and cherry mix. Tip: Share one of their community dishes like the roasted cauliflower or the meat and cheese for a light, yet tasty alternative. If you need a quick bite to eat, then Open Market is your go-to spot for fresh made-to-order meals. The market serves some of the best food for a grab-and-go breakfast or lunch, and the breakfast menu is available all day. Fill up with a breakfast bacon burrito or try the roast beef sandwich. Tip: Check out the local goods sold here. Chips, dips and juices are all up for grabs and great to stash away for an afternoon treat. A restaurant, lounge and sports bar all in one, the Draft Sports Bar & Lounge is an ideal hangout spot after a long day of exploring the city. 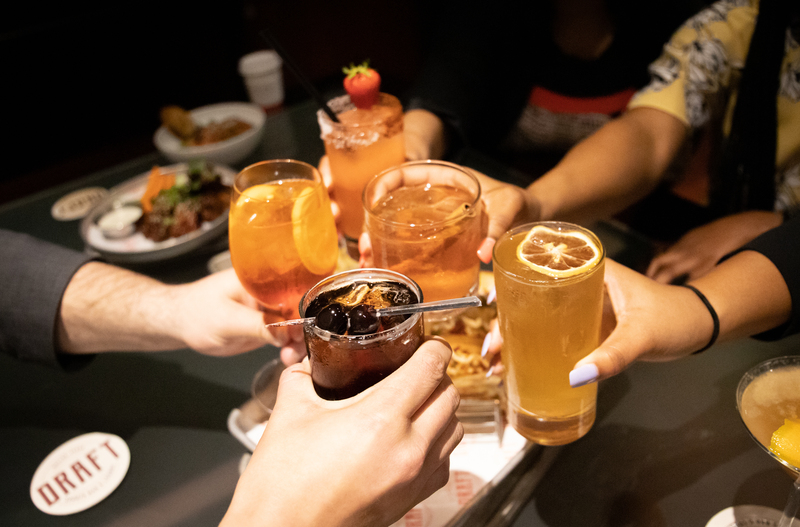 With multiple HD TVs, as well as shareable bites like popcorn shrimp, spinach artichoke dip and Korean BBQ wings, make it the perfect setting to cheer on your favorite teams. Not into sports? The sports bar still delivers an exciting time with its vast menu of cocktails and beers, as well as a private karaoke room to rock out with your crew. Tip: Taste the pork rinds, which are offered complimentary for every table and definitely worth the extra calories. The Parlor offers an intimate space and homey atmosphere with its plush furniture and numerous wood bookshelves. Wind down with a glass of wine or sip a specialty cocktail, like the reimagined Daquiri, which features mahogany-infused mezcal. With numerous wines and cocktails to try, as well as plenty of games like Scrabble, Clue and Shuffleboard to play, The Parlor has just what you need for a relaxing and enjoyable evening with friends. Tip: If you're feeling fancy or want to celebrate a special occasion, order from their specialty and upscale wine collection or book the room for a private event. Devon is a Dallas native with a love for arts and music. You can find her exploring the multiple museums in Dallas or attending a R&B or hip-hop concert. She enjoys traveling, preferably to the beach, and appreciates any well-written magazine or book. Additionally, Devon is a pop culture enthusiast, so she's your go-to girl for all hot topics and celebrity news. Try a taste of Texas on your next getaway to Dallas. Where to go for a delicious and guilt-free meal in the city. The recently renovated hotel is a booming dining hotspot. Here's an inside scoop on the six restaurants in the hotel.